Elgg theme Friend Finder Plus is a professional theme designed in Elgg. 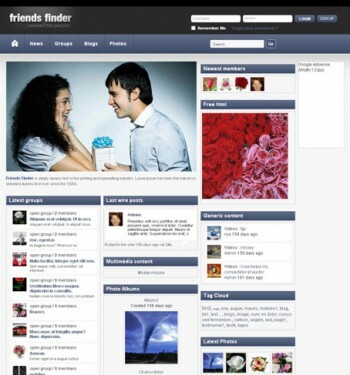 It is an improved version of the popular FriendFinder Elgg Theme. It gives a classy look into your Elgg instance in a few minutes. It helps to customize and configure the look and feel of your site from the admin console. It has a young and vibrant look. Other Elgg plugins are also used with this. It has a search engine optimized HTML. It supports almost the main browsers used (Firefox, Chrome, Internet Explorer, Safari, Opera). It’s compatible with all the major plugin like Blog, Groups, Files, Pages, izap videos, Tidy pics etc. It has widgetized areas which allow you to dynamically manipulate these areas. When enabled, it will be fast loading to the website. Clarity in source code is maintained. Support browsers such as Mozilla Firefox, Opera, Google Chrome and Safari in addition to Internet Explorer. It is compatible with additional functionality and languages. Supports the Elgg version Elgg 1.7.6, Elgg 1.7.7, Elgg 1.7.8, Elgg 1.7.9, Elgg 1.7.10, Elgg 1.7.11, Elgg 1.7.12, and Elgg 1.7.13. It’s very clean, simple and easy to edit to meet your colors variations.